NEW ORLEANS – It was Moving Week in the NCAA Division I Men’s Indoor Track & Field National Team Computer Rankings. Twenty-three teams shifted spots in the most recent index that was released Monday by the U.S. Track & Field and Cross Country Coaches Association (USTFCCCA). The only two programs that remained in place were Florida at No. 1 and Kansas at No. 23. The Gators have been a mainstay in the No. 1 spot since last season. This is the 12th week in a row that Florida has been ranked No. 1 in the National Team Computer Rankings and 23rd time in the past four years. Texas Tech made up the most ground on the Gators and comes in at No. 2 this week, usurping that position from Georgia. Divine Oduduru and Andrew Hudson paced the Red Raiders’ charge this past weekend as they scorched the track in the 200. Oduduru clocked the third fastest time in collegiate indoor history (20.25) and Hudson is third nationally at 20.49. Alabama climbed back into the top-5 for the first time in two weeks. The Crimson Tide saw Shelby McEwen clear 2.24m (7-4¼) in the high jump, which ties him for the fifth best mark in NCAA Division I this season. Stanford made the biggest jump into the top-10 this week as it soared from No. 17 to No. 8, its best ranking since Week 1 of 2015. The Cardinal flew nine spots in the rankings thanks to the efforts of its DMR team, which recorded a time of 9:32.98, the third fastest in the nation so far. Virginia Tech went from No. 16 to No. 9 as a trio of milers turned in strong performances at the Camel City Elite in Winston-Salem, North Carolina. Vincent Ciattei, Patrick Joseph and Neil Gourley rank fifth, sixth and seventh, respectively on the Descending Order List. Indiana halved its rank as it went from No. 22 to No. 11. The Hoosiers can attribute their rise to their outstanding DMR team, which owns the top mark in the nation at 9:31.64. Further down in the rankings you can find both Michigan and Syracuse which made upward trajectories from Week 2. The Orange went from No. 25 to No. 19 after Justyn Knight turned in a sizzling 3000 (7:45.86), while the 20th-ranked Wolverines climbed back into the top-20 for the first time since Week 2 of last year. 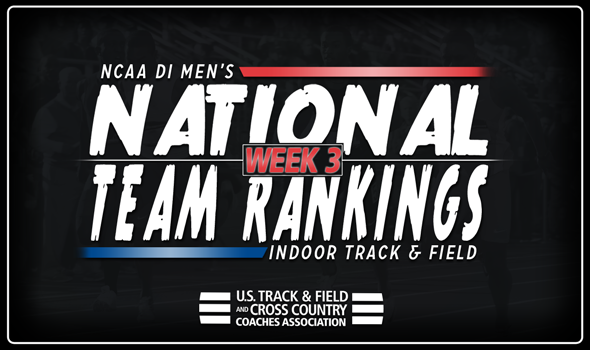 Be sure to check back every Monday as these rankings will continue to evolve as the 2018 NCAA Division I Indoor Track & Field Championships – which will be held March 9-10 in College Station, Texas – come into focus.